Multiple myeloma (MM) as one of the lymphoid neoplasms, is characterized by the accumulation of abnormal plasma cells in bone marrow ,.MM is the second most common hematological malignancy, accounting for 10% of all hematological malignancies. MM can affect various organs function in patients and result in a series of symptoms such as bone pain, renal failure, infection and neurological disorders -. It is estimated that total 14541 cases will suffer MM in the year of 2010 and the number of incidence cases are likely to increase to 21754 by 2020 in India . In addition, the overall survival time for patients with MM ranges from 6 months to 10 years with mean of 3 to 4 years . MM remains an incurable hematological malignancy, despite of conventional and advanced chemotherapy. Hypericin, a natural polycyclic quinone, is mainly extracted from the plants of hypericum genus . Hypericin has been regarded as a promising photosensitizing agent for its characteristic of light-dependent antineoplastic and antiviral activity . Hypericin-mediated PDT has obtained increasing interests as a potential treatment for various cancers -. Currently, multiple pathways have been found to involved in the tumor cell death program induced by hypericin-mediated PDT, such as mitochondrial pathway ,, lysosomal damage , alternation of intracellular pH level , _ENREF_19, Bcl-2 phosphorylation by CDK-1  as well as the increase of intracellular Ca2+ stimulated apoptosis -. However, the mechanism underlying hypericin-mediated PDT for MM suppression has been not clarified clearly. SP2/0 cells without any treatment were set as controls. The MTT assay was performed for SP2/0 cells at each condition according to the manufacturer’s instructions. In brief, 10 μl of MTT (5 mg/ml; Sigma) was added in each well for 4 hours at 37°C. After removal of the medium, the MTT crystals were dissolved with 100 μl DMSO for 15 min. The absorbance at 550 nm was measured by a Multiskan Spectrum 1500 (Thermo Electron Corporation, USA). The inhibition rate of cell proliferation was calculated as follows: (A550control -A550treated) / A550control × 100% and the IC50 value was obtained by Logit method . Western blot analysis was performed as previously described -. Protein samples (40 μg) were separated by 8-12% (8% for PARP-1; 10% for AIF, β-actin; 12% for Bcl-2, Bax, Cytochrome c, Histone 2A, Caspase-3) sodium dodecyl sulfate-polyacrylamide gels electrophoresis and transferred to polyvinylidene fluoride membrane (Immobilon PVDF, Millipore). The membranes were blocked in 10% non-fat dried milk in TBS-T (10 mM Tris–HCl (pH 8.0), 150 mM NaCl, and 0.1% Tween) for 2 hours at room temperature. Then the membranes were incubated with the primary antibodies of anti-Bcl-2 rabbit monoclonal antibody (1:1000), anti-Bax rabbit monoclonal antibody (1:1000), anti-caspase-3 rabbit polyclonal antibody (1:1000), anti-PARP rabbit polyclonal antibody (1:1000), anti-β-actin mouse polyclonal antibody (1:1000), anti-cytochrome c rabbit monoclonal antibody (1:1000), anti-AIF rabbit monoclonal antibody (1:1000), and anti-H2AX rabbit monoclonal antibody (1:500), respectively, overnight at 4°C. All the antibodies were purchased from Cell Signaling Technology (Beverly, MA, USA). Subsequently, membranes were washed three times with Tris-bufffered saline, 0.1% Tween-20 and then incubated with the peroxidase-conjugated secondary antibodies for 1 h. The membranes were washed three times again and developed using enhanced chemiluminescence (ECL, Amersham Biosciences). Bands were visualized using the ChemiDoc™ XRS+ System with Image Lab™ Software (Bio-rad, USA). Protein expressions were quantified by densitometry analyzed using Quantity One 4.5.2 software (Bio-Rad, Hercules, USA). Proliferation of SP2/0 cells determined by MTT assay. (A) SP2/0 cells were treated with different concentrations of hypericin (0-10μΜ) and irradiation doses (0–14.12 J/cm2) for 24 hours. (B) SP2/0 cells were treated with different concentrations of hypericin (0–0.1μΜ) and irradiation dose of 11.28 J/cm2) for 24 hours. Results were shown as mean ± SD, n = 5, *p < 0.01. 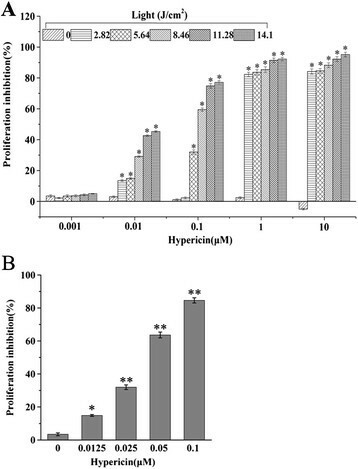 Morphological changes assayed in SP2/0 cells exposed to the indicated concentrations of hypericin at 24 h after applying 11.28 J/cm 2 irradiation dose. (A) Light microscopy analysis of morphological alternations in SP2/0 cells. (a) Untreated control cells. (b), (c) and (d) Cells treated with hypericin at 0.025, 0.05 or 0.1μΜ. Bar = 10 μm (B) Apoptotic or necrotic nuclei of SP2/0 cells evaluated using fluorescence microscopy with Hoechst 33342 (blue) /PI (red) double staining. (a) Untreated control cells. (b), (c) and (d) Cells treated with hypericin at 0.025, 0.05 or 0.1μΜ. Arrow: apoptotic nuclei; Arrow head: necrotic nuclei. Bar = 10 μm. (C) TEM analysis of ultrastructural alternations of SP2/0 cells. (a) Untreated control cells. (b), (c) and (d) Cells treated with hypericin at 0.025, 0.05 or 0.1μΜ. Arrow: apoptotic bodies; Arrow head: swollen mitochondria. (D) The percentage of apoptotic or necrotic nuclei was analyzed in a total of 200 cells from five random areas. 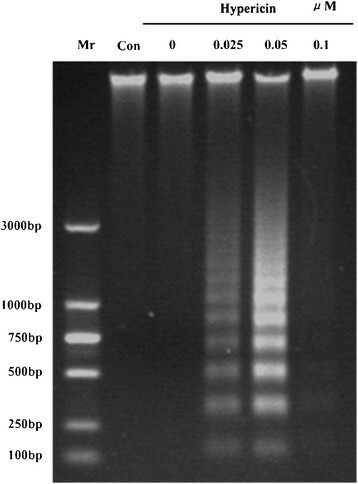 Analysis of DNA fragments from SP2/0 cells treated with the indicated concentrations of hypericin at 24 hour after applying 11.28 J/cm 2 irradiation dose by agarose gel electrophoresis. Mr: maker; Con: control. The changes in the mitochondrial membrane potential of SP2/0 cells were detected by JC-staining with flow cytometry. After hypericin-mediated PDT treatment, the red-orange mitochondrial fluorescence decreased, while more of the green fluorescence (JC-1 monomer) was observed in cytoplasm (Figure 4A, B). Compared with cells with only post-radiation therapy (3.61), the ratio of JC-red/JC-green was significantly decreased in cells intervened by PDT with hypericin at 0.025 μM (1.74) and 0.05 μM (0.47), (P < 0.05) which suggested that the loss of mitochondrial membrane potential (Figure 4C). Hypericin-mediated PDT activated both caspase-dependent and AIF mediated caspase-dependent signaling pathways. Hypericin-mediated PDT regulates Bcl-2 family proteins expression and results in cleavage of caspase-3 and PARP. SP2/0 cells were treated with hyerpicin-mediated PDT for 24 h. Whole cell lysate was prepared and assayed for Bcl-2, Bax, Caspase-3 and PARP proteins, cytosol fractions were used to assay cytochrome c and nucleus fractions were used to assay AIF. Relative protein expression is shown at the bottom of each panel, with control levels arbitrarily set to 1. 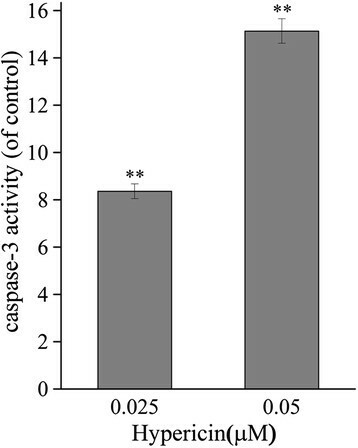 Caspase-3 activity assay. SP2/0 cells were treated with hypericin (0.025 or 0.05 μM) for 16 hours. At 24 hour after 11.28 J/cm2 irradiation, caspase-3 activity was measured by colorimetric method. Y axis represents the caspase-3 activity (OD405nm of treated cells/ OD405nm of controls). MM is the most common bone marrow malignancy. It is reported that there are 114,000 cases diagnosed with MM and 80,000 deaths resulting from MM in 2010 worldwide . MM remains an incurable bone malignancy with severe complications and poor prognosis for MM patients. The increasing studies for MM treatment contribute to the evolution of therapies, the increase of survival time and the improvement of life quality for patients. Hypericin-mediated PDT is reported to be an attractive candidate treatment modality for human cancer cells. The evidence of the inhibitive effect of hypericin-mediated PDT on MM is insufficient. In this study, we further explored the mechanism of the apoptosis of mouse myeloma SP2/0 cells induced by hypericin-mediated PDT at different concentrations of hypericin. Apoptosis has been determined to be the most prominent event in the tumor tissue destruction induced by hypericin-mediated PDT. In order to assess the involvement of apoptosis in tumor response to hypericin-mediated PDT, the hallmarks of apoptosis including DNA fragmentation and morphological changes were investigated in this paper. Results showed that low doses of PDT with hypericin (0.025 and 0.05 μM) induced apparent morphological and biochemical characteristics of apoptosis in SP2/0 cells such as cell shrinkage, chromatin condensation, formation of apoptotic bodies as well as DNA laddering, while high dose of PDT with hypericin (0.1 μM) led to cell necrosis (Figures 2 and 3). As outlined in previous studies, apoptosis induced by PDT can be observed at lower hypericin concentrations and fewer light intensities, whereas necrosis occurs at high hypericin concentrations and light intensities ,, which is consistent with our findings. 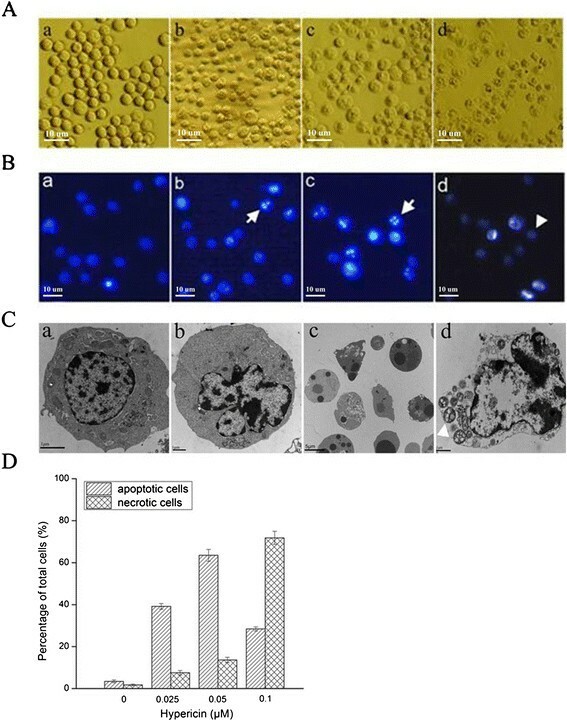 The transitions from apoptosis to necrosis in a drug and light dose-dependent manner induced by hypericin with PDT have also been observed in HeLa cells and human epidermoid carcinoma cells in vitro,. All these showed that hypericin-mediated PDT is a potent inducer of apoptosis or necrosis in MM SP2/0 cells depended on the dosage of PDT, despite of the factors such as the location of the photosensitizer, the nature of photosensitizer as well as the genetic and metabolic potential of the cell type. It is demonstrated that the apoptosis induced by hypericin-mediated PDT mainly resulted from the activation of apoptosis related pathways in response to the oxidative stresss and other signals . It is reported that the apoptosis pathways induced by hypericin-mediated PDT are involved with plasma membrane death receptors, mitochondria, lysosomes and ER, caspases, and Bcl-2 family proteins . Bcl-2 family proteins play key roles in the mitochondria-mediated cell death . 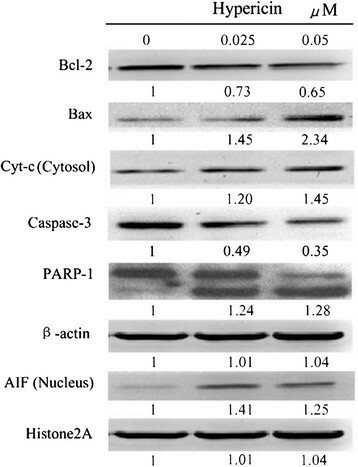 The expression of Bcl-2 family proteins can induce the mitochondrial membrane permeabilization, which causes the release of caspases or apoptosis inducing factor (AIF) . The up-regulation of Bax/Bcl-2 ratio is found to be associated with the decrease of mitochondrial membrane potential that inhibits the growth of cancer cell growth . In the present study, results of western blotting suggested that the expression of anti-apoptotic Bcl-2 protein was decreased and pro-apoptotic Bax protein was increased induced by hypericin-mediated PDT and thus shifted the Bax/Bcl-2 ratio that leaded to loss of the mitochondrial membrane potential in favor of cytochrome c and AIF release. In the apoptosis process, the release of cytochrome c induced the activation of caspase-9 and then activates caspase-3 . Caspase-3-mediated cleavage of the 116-kDa PARP protein into 89-kDa fragments is a hallmark of apoptosis . The present study also showed that caspase-3 activity was increased that contributed to PARP cleavage and DNA degradation. In fact, cytochrome c-mediated capsase dependent apoptotic pathway and AIF mediated caspase independent apoptotic pathway are complicated but not completely independent. AIF in the cytosol could promote cytochrome c to be released from mitochondria and the activated caspases also facilitate translocation of AIF from mitochondria to the nucleus  _ENREF_34. Besides, the present study further showed that the apoptosis induced by hypericin-mediated PDT was inhibited significantly by the pan-caspase inhibitor zVAD-fmk or special caspase-3 inhibitor Ac-DEVD-CHO. All these indicated that AIF release might be facilitated by casapse and hyerpicin with PDT induced apoptosis mainly depended on caspase-mediated cell death pathways.